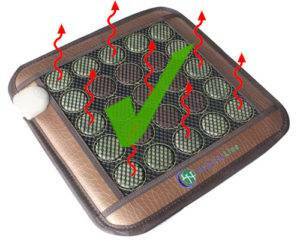 Healthy Wave mats provide far-infrared heat which is much more beneficial than regular heaters and heating method. The following are the differences between regular heat therapy and far Infrared heat therapy. Heated air can feel very hot but only heats the outside of the body. The heat does not penetrate the body but heats the skin the most with lesser heat penetrating deep into the tissue. High temperatures, if used improperly, can cause heat exhaustion and other negative effects. Uses non-woven fabric wiring to directly heat gemstones (jade, amethyst & tourmaline). When heated the gemstones (jade, amethyst & tourmaline) generate far-infrared heat. 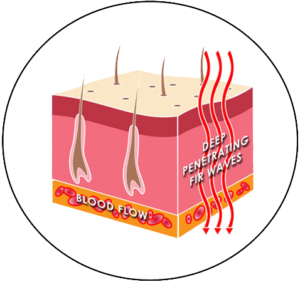 Far-infrared heats your tissue directly penetrating several inches inside you. Due to the heat being able to penetrate several inches of your tissue that tissue is heated more evenly and is able to heat deeper tissues inside the body. Requires a lower overall heat to provide the heat therapy needed for the muscles & other tissue. Using a lower heat is safer as it can prevent heat exhaustion and burns. It can also be used for longer periods of time safely. Using a lower heat is also more efficient as it uses less energy while providing more heat to the tissue you are trying to heat rather than the surrounding air or skin. 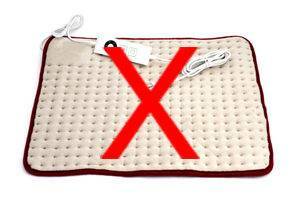 Healthy Wave mats heat up to a max of 70 degrees Celsius and take as little as 5 minutes to heat up! FIR from a sauna does not penetrate as deeply as they do from the Healthy Wave Mats. The FIR from the Amethyst and Tourmaline crystals in the Healthy Line mat penetrate twice as deep ( 3-8 in) into our tissues as the regular FIR sauna does. ( 2-3 in) Crystals amplifies the naturally occurring FIR and makes it more bio-available to the cells then a FIR sauna. Penetrates 3-8 inches under your skin heating the surrounding tissues more evenly. Heat expands deep blood vessels improving circulation & allowing more oxygen rich blood into the surrounding tissue to heal inflammation and other affected areas. Far Infrared heat can help modulate sleep patterns and when used in combination of the crystals used in Healthy Wave Mats can improve the sleep cycle. Gently increase blood flow and expanding capillaries that carry blood which promotes oxygenation and regeneration of damaged cells. Overall far infrared heat is one of the most beneficial therapies as it can literally improve & supports all the systems in the body. Extensive research has been done by the FDA & other independent organizations proving far infrared heat therapy improves overall health, increases oxygen in blood, helps injuries heal quicker & increases your feeling of well-being. Healthy Wave Mats are one of the most effective delivery system for far infrared heat. Other common products that generate far infrared heat such as saunas and external heaters need to generate higher temperatures as the far infrared heat sources are further away from the body. This creates a similar problem as regular heaters as higher heat levels are required to provide the same level of far infrared heat to penetrate the tissue effectively. Healthy Wave Mats are designed to be used directly against the skin which allows the far infrared heat to penetrate the skin deeper at a lower temperature. This allows the user to receive the benefits of far infrared heat therapy for a longer period of time, locate it against any area of the body and be in a more comfortable environment during the process. Multiple designs make it easy to target any area on the body easily. A lower overall heat is required allowing the user to use them longer. 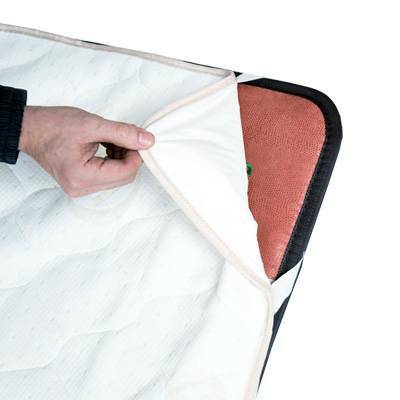 Larger mats allow the user to cover a larger portion of the body providing far infrared heat to more locations on the body. By lying on one mat and placing reflective foil blanket or another small mat on top the user can create a sauna effect delivering far infrared heat to the entire body. Examples of how areas are targeted are shown below.